Valerie Artis has had her eye on Chick-fil-A since first falling in love with the brand 12 years ago on a trip to Atlanta. Holding strongly to her personal belief that, “Service is not simply something to do, but is also a way to live,” Artis found a commitment to service in Chick-fil-A that mirrors her own. Prior to joining Chick-fil-A, Valerie spent 20 years as a marketing professional in the restaurant industry. Outside of work, Valerie cultivated community ties through service opportunities, which allowed her to work side by side with her husband and two sons. After repeated nudges from friends who suggested Valerie open her own Chick-fil-A restaurant, she finally embraced the opportunity in 2013 and submitted her application. Waiting to hear from Chick-fil-A on whether she was selected as an operator presented Artis with a unique opportunity to share a life lesson with her sons: that striving for your goals is important, no matter the outcome. At the time, one of her sons was gearing up for college applications and was nervous about being accepted by his top-choice schools. For both of them, the results were positive. Her son is college-bound, and Valerie—along with her husband and two sons—is now opening her Chick-fil-A restaurant in the heart of Bellevue, Wash.
As Valerie settles in to the Pacific Northwest, her first order of business–after opening her restaurant—is to fully immerse herself in the community. Whether it is supporting local youth programs, inviting neighbors and community members into the restaurant as her personal guests or volunteering at city events, Valerie will certainly be spotted around town—even at CenturyLink Field. As a proud “12th man,” Valerie has been supporting the Seahawks long before her family relocated to Washington. The solidarity of the 12th man and their loyal team support builds community, and that’s at the heart of everything Valerie does. 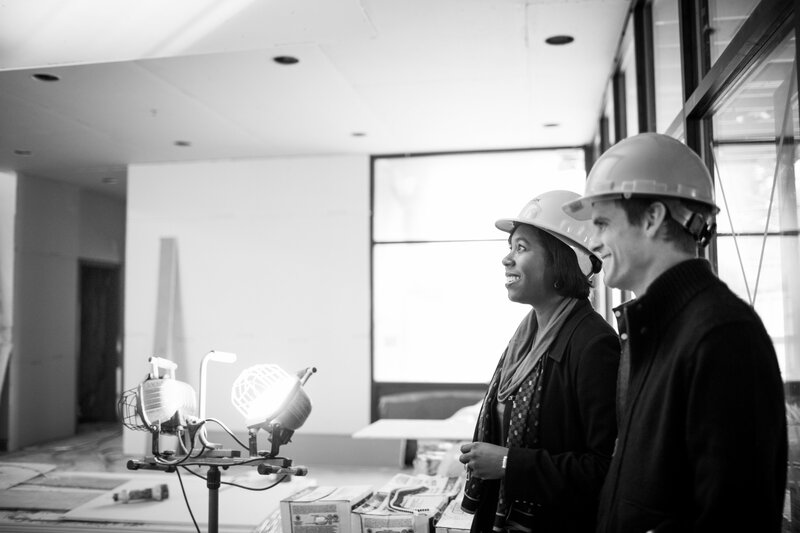 Operator Valerie Artis takes an early look at her future Chick-fil-A. Q: Why did you choose to look at the Seattle area to open a Chick-fil-A? A: My husband and I spoke of moving to the region, and we specifically targeted Bellevue. I think it’s one of the best-kept secrets in this country and I love the culture and community here. A: Chick-fil-A has always resonated with me because of the strong ties that every single restaurant has with its community. Chick-fil-A is a natural fit for my family and me because community service is a huge part of my household. It is how I was raised and how I raised my two sons. Q: What role do you see your store playing in the community? A: I think my location is in a unique position because it’s in the middle of two worlds, a crossroads between the downtown urban vibe and the suburban neighborhoods. This will allow my restaurant to be a place where everyone can come together and connect—whether hosting a meeting over coffee or enjoying a meal with family and friends. I also see my restaurant as a stepping-stone for my employees either to move up in Chick-fil-A or to take the experiences they gain from working with my management team and me as they move forward in their lives. A: I am passionate about the great outdoors and am excited to explore all of the great trails that the Pacific Northwest has to offer. I am also very passionate about mentoring young people. For several years, I’ve coached a community youth track & field team and would love to connect with a program in Bellevue that is interested in exposing youth to the basic fundamentals of the sport. For me, it is important to motivate and mentor youth to always strive to be their best and know that they can do anything they put their minds to. Q: What was your first experience like at Chick-fil-A? A: In 2003 I was traveling in Atlanta for work. I had always heard great things about Chick-fil-A and I wanted to experience it for myself. I was wowed by the compassion and attention of the team members. Sarah—I’ll never forget her—attended to me and had a genuine spirit about her. The food was excellent, but the thing that kept bringing me back to Chick-fil-A was the customer service. Valerie will open the doors to Chick-fil-A at Northeast 8th Street in Bellevue on April 9, 2015. If you’re interested in joining Valerie’s team, she’d love to hear from you.